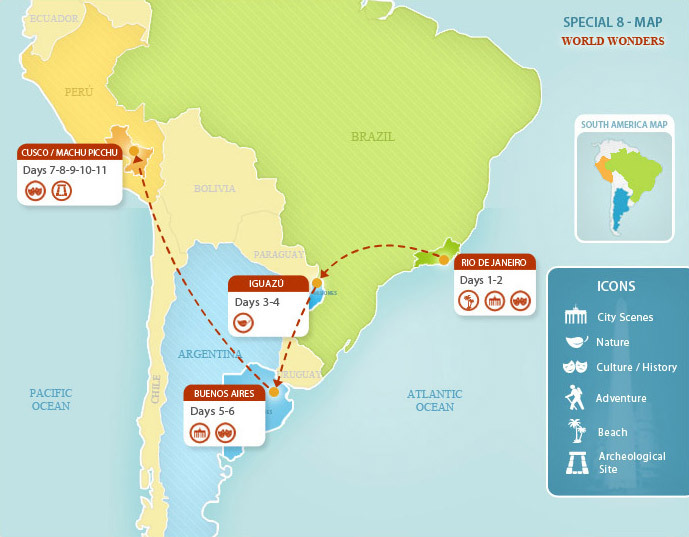 Discover the best of Argentina, Brazil, and Peru on a once-in-a-lifetime South America vacation package to the region’s most impressive destinations. Start off in Rio de Janeiro, Brazil, where you’ll enjoy the tropical climate and see the statue of Christ the Redeemer, named one of the New 7 Wonders of the World. From Rio you will continue onto the spectacular Iguazú Falls, arguably the most magnificent waterfall system in the world. From there, you will be dazzled by Argentina’s capital city, Buenos Aires, a city synonymous with sophistication and European-style. Finally you will travel on to Cusco, Peru, the former seat of the impressive Inca Empire. You’ll get to tour the city, the nearby Sacred Valley, and the majestic Machu Picchu citadel - also named one of the New 7 Wonders of the World. You will have the remainder of the afternoon to spend at your leisure, resting at your hotel or exploring Buenos Aires on your own. You'll end your day by discovering tango at one of the most exclusive Buenos Aires tango houses, Tango Porteño. Enjoy a deliciuos gourmet dinner while musicians and professional tango dancers perform before you. Tango shows in Buenos Aires can be compared to broadway shows, with a live orchestra accompanied by professional tango dancers. The tour will end at your hotel and you will have the remainder of the evening to explore on your own or rest and relax before your visit to Cusco. Upon arrival to the Cusco airport, a Peru For Less representative will meet you for the drive to the historic center. On the way to your hotel, you will see examples of Spanish colonial architecture constructed upon the remains of ancient Inca palaces and temples. Spend the morning at your leisure. This is a good time to explore some of Cusco's less-visited attractions including the San Pedro Market, the bohemian neighborhood of San Blas, or one of many museums, such as the Museum of Pre-Colombian Art, Casa Concha, or the Choco Museum, where you can make your own chocolate from scratch. In the late afternoon, you'll return to your Cusco hotel. Spend the evening at your leisure enjoying the local cuisine and the hospitality of the Cusco locals. Check out our Cusco Travel Guide for suggestions. Five blocks from Cusco’s Main Square and tucked away in the artsy neighborhood of San Blas, the colonial Casa Andina San Blas hotel features a charming courtyard and a view of the Inca city from almost all its rooms as well as its central lobby. The bar and chimney complement the hotel’s Cusqueña colonial architecture and make Casa Andina San Blas one of the most cozy and inviting hotels in town. Delicious Novoandino cuisine is served in the hotel’s excellent rustic restaurant. All rooms are comfortable, tastefully decorated with warm colors, and equipped with all modern amenities. Here, visitors will find friendly staff providing an excellent and personalized service.